Recorded/performed at: Electric Avenue Studios, Sydney, on Sep 18. Richard Charlton Matthew Withers, Acacia Quartet 15 mins, 44 sec. Recorded/performed at: Electric Avenue Studios, Sydney, on Sep 18. Robert Davidson Matthew Withers 6 mins, 22 sec. Recorded/performed at: Electric Avenue Studios, Sydney, on Sep 18. 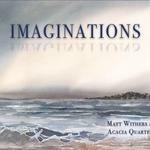 Robert Davidson Matthew Withers, Acacia Quartet 10 mins, 39 sec. Recorded/performed at: Eugene Goossens Hall, ABC Ultimo Centre, Sydney, on 2013. Moya Henderson Acacia Quartet 6 mins, 19 sec. Recorded/performed at: Electric Avenue Studios, Sydney, on Sep 18. Phillip Houghton Matthew Withers, Acacia Quartet 16 mins, 7 sec. Recorded/performed at: Electric Avenue Studios, Sydney, on Sep 18. Gordon Kerry Acacia Quartet 20 mins, 12 sec. Recorded/performed at: Electric Avenue Studios, Sydney, on Sep 18. Nick Wales Acacia Quartet 4 mins, 6 sec. Also includes: Water Music / Wade Gregory -- Solitude / Nava Ryan -- Storming / Rick Alexander. Featuring the winning works of the 2018 Matt Withers Australian Music Composition Competition (Wade Gregory, Rick Alexander & Nava Ryan) plus works Richard Charlton, Robert Davidson and the late Phillip Houghton: three of Australia's most respected composers whose music will surely inspire, move and entertain. The Imaginations double album will also include premiere recordings of Robert Davidson's solo guitar work Forest, Gordon Kerry's String Quartet No. 5, Moya Henderson's Kudikynah Cave and a recording of Nick Wales' Harbour Light. Liner booklet includes programme notes and biographical information about the composers and performers. Score & Part: In amber : for string quartet & classical guitar / by Phillip Houghton. Score: Landscape : for guitar and string quartet / by Robert Davidson. Score: Kudikynah Cave : string quartet / by Moya Henderson. 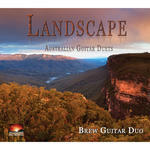 CD: Toccata / Melbourne Guitar Quartet.